I was shopping with Jan and she saw these mini bell peppers. She wanted them stuffed for her Mother’s Day meal. I decided that I would fill them with taboulah. A few days ago, Jan was talking with someone from Lebanon. He was complaining that all of the tabouleh being served in America was Isreali (more bulgur than parsley). Lebanese tabouleh has more parsley and just a hint of bulgur. Bulgur is a processed wheat that comes in four grades, #1 Fine, #2 Medium, #3 Coarse and #4 Extra Coarse, based on the size of the grains. For tabouleh, many recipes call for Fine bulgur, but I prefer the Medium for the better chew it provides. When I check my tabouleh recipe, I noticed that there was no garlic. I went back to the original recipe thinking that I had left it out. Oliver oil, lemon, pepper, salt, but No Garlic! This just did not see right! I had to add at least a little. After Dinner Note: These were good, but son-in-law, Chris, thought the raw peppers were too crunchy. Lightly roasting them, until just soft, might work. Chris’ solution was to eat them with the grilled onions from the game hens and that went together really well. Maybe next time I will stuff the peppers with grilled onions, instead of tabouleh. 1. At least 6 hours before the dinner, put the bulgur in a bowl and add two cups of cold water. Let the grain sit for an hour and then drain it through a sieve. Press as much water out as you can. Tip: Tabouleh is best made the day before, so that the flavors may meld. 2. Spread the bulgur out onto a tightly woven clean dish towel. Fold the towel, so that the grain cannot escape and squeeze as much water out as you can. Lay the towel out to let it dry further for 15 minutes. Scrape the bulgur off the towel back into the dried bowl. 3. Wash and dry the parsley, green onions and mint. 4. Chop the green onions very fine and add them to the bowl. Use your hands, or the back of a wooden spoon, to squeeze the mixture so that the bulgur absorbs the onion flavor. 5. Chop the parsley and mint very finely and mix it into the bowl. 6. Place the olive oil, lemon juice, garlic, pepper, salt and mustard into a small lidded jar and shake well. 7. Add 2 tablespoons of the dressing to the salad and mix well. Let the salad meld, stirring occasionally. If you make it the day before, refrigerate until an hour before serving. 8. An hour before serving, seed and dice the cucumber and tomato. Add them to the salad and mix them in. 9. Cut the tops off of the bell peppers and remove the seeds and veins. 10. Stuff the peppers with the taboulah and spoon any remaining dressing into the tabouleh. 11. Put any remaining tabouleh in the bottom of a serving bowl and arrange the peppers with the salad pointing up. 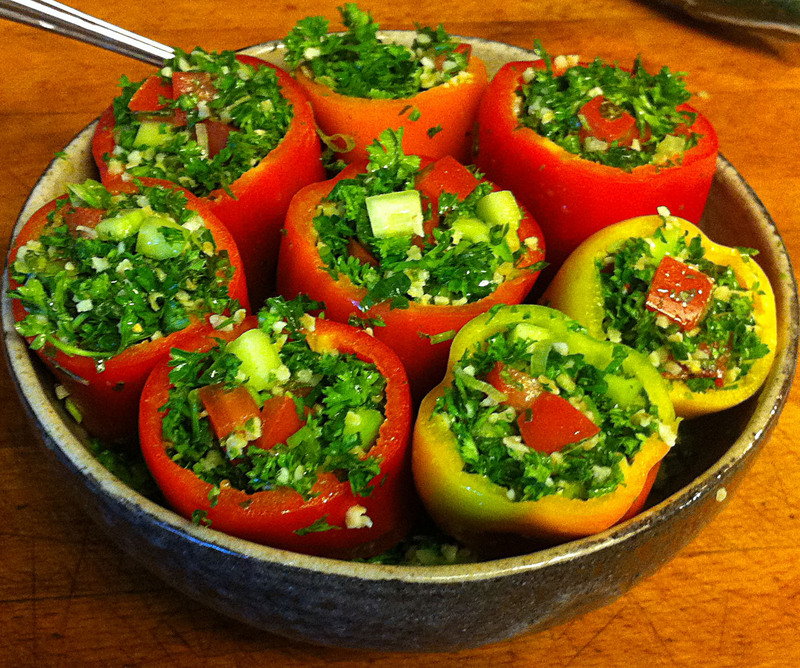 Tip: The tabouleh in the bottom of the bowl helps stabilize the peppers so they do not tip over.